Up to the present we have only dalt with main line passenger engines in these notes, if we except the "toy" tanks of the "Economy" series, and "Small Bass," which was a special job in a class by herself ; so now I propose to vary the proceedings by describing an engine of the goods type, which you can build by following the instructions, yet amend and alter to suit your own fancies without impairing its efficiency. 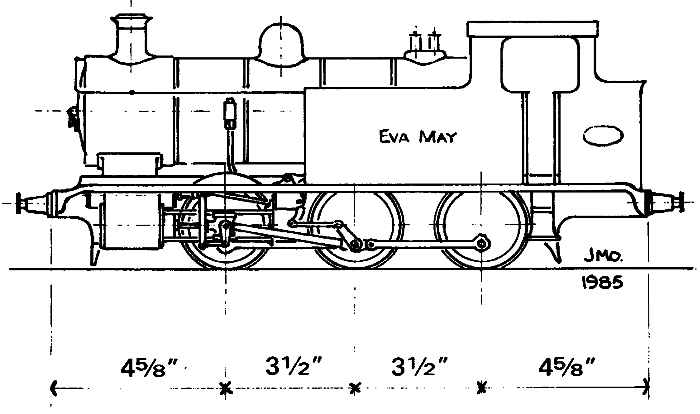 The great drawback to mainline passenger engines is not any fault in the locomotives themselves, but merely when you build them above 2½-in. gauge, they begin to get uwieldy and want a terrible lot of space to run, more than provided for in the average suburban garden : and it takes two of you all your time to carry them to and from the track. The constructional series appeared in English Mechanics : 16/12/32 (original tank & tender), 16/6/33 (inside cylinder version), 10/11/33 (large boiler version). TEE Publishing can supply a facsimile of the constructional series.